Transform, migrate, innovate at your own pace: Azure has a purpose-built approach to provide organizations cloud benefits for their SAP estate – both traditional as well as SAP HANA OLAP and OLTP production deployments. 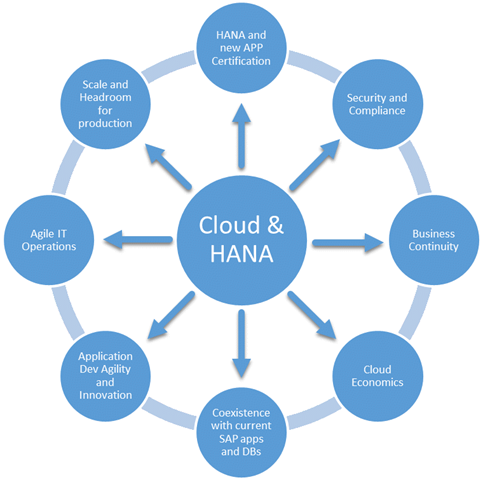 Read more about the SAP certifications. You will always find something new. No Compromises: The approach is to marry the benefits of bare-metal SKUs that are unencumbered by virtualization in terms of ability to scale, provide superior and consistent performance while surpassing expectations on availability, business continuity and development and operational agility of the cloud. The proof is in the pudding. After supporting the largest scale SAP HANA deployments up to 3 TB in October, we are now announcing general availability of an even larger scale – 4TB Scale up and 32 TB Scale out on Dec 1, 2016 , proving that we will continue on this blistering pace. We are the first Hyper-Scale cloud vendor delivering Intel Broadwell based solutions, scaling to 192 threads. For more information, read more about scale. SAP HANA Large Instances offer an availability SLA of 99.99% for an HA pair, the highest among all hyper-scale public cloud vendors. These instances provide built-in infrastructure support for backup and restore, high availability (HA) and disaster recovery (DR) scenarios. Additionally, these instances have integrated support with partners, including SUSE Linux Enterprise, Red Hat Enterprise Linux and SAP, so you can confidently bring your production workloads to Azure. By moving SAP HANA to Azure we have been able to speed up planning cycles and accelerate delivery of finished goods to our customers. We have also activated real time reporting to monitor and improve process productivity across our global supply chain. The potential for using data in smarter ways to operate more efficiently, save money, and satisfy customers is immense. Azure gives us integrated tools that let us fully interrogate and exploit our data. SAP Partnership: After seeing Satya Nadella and Jim McDermott on stage at Sapphire 2016 one does not need any more proof that it is a decades long strategic partnership that is critical to enterprises. But more proof arrived within 60 days – SAP chose Azure as the cloud to run their fastest growing and most exciting SAP HANA based SaaS platform, SuccessFactors HCM Suite. Digital Transformation with Azure and SAP HANA: It is important to not lose sight of why all of this is so crucial in the first place. In the world defined by Uber, Netflix, online retail it is clear to CEOs that their survival depends on Digital transformation. And for the 200,000 organizations that manage their LOB applications with SAP, their ability to transform is gated by them traversing two journeys. Destination – Cloud and SAP HANA. And since the two are inextricably related, they need a single strategic partner, who is a premier public cloud vendor, has a long-term relationship with SAP and who understands how to work with enterprises. After talking to a few CIOs and service managers, it was clear to me that they are faced with a series of conflicting demands where neither choice made at the cost of other is palatable. The diagram below is my consolidated view of that dilemma. Watch this 8 minute Video that provides more detail on how Microsoft Azure approaches this problem in a unique way, so that you don’t have to make compromises and why you need to contact your account team to set up a design workshop. If you are not sure who to contact, visit request information and someone from Microsoft will reach out.To learn more technical details, visit Getting Started with SAP on Azure.